This heavy duty boxed way machine was made with a raised column allowing for a unique 53" of travel in the Z axis. It comes with a 18" diameter Tsudakoma 4th axis rotary table, 40 station side mounted tool changer and coolant through the spindle. It can be seen under power by appointment only. 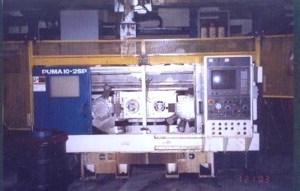 2001 Daewoo Mynx 530 CNC Vertical Machining Center. Machine is in good condition and can be inspected under power upon request. Machine has box ways, rigid tap, and Fanuc OiM control. Please contact Mark Lipowski at 224-465-6465 with any and all questions. In good working condition and can be inspected under power upon request. Purchased from Champion Machinery and barely used!! This DAEWOO MYNX 500 Vertical Machining Center was made in 2001 in South Korea and has been operative for 12841 hours since then. Equipped with a FANUC Series 21-M Control unit, this reliable machine presents very good conditions.